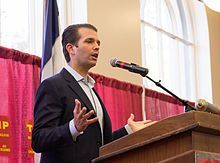 Date of birth Dec 31, 1977 New York City, New York, U.S.A.
Residence New York City, New York, U.S.A.
Donald John Trump Jr. (born December 31, 1977) is an American businessman and former reality TV personality. He is the oldest child of the 45th President of the United States, Donald Trump, and his first wife, Ivana. A fourth generation businessman following in the footsteps of his great-grandmother who founded the company (Elizabeth Trump), grandfather Fred Trump, and father, he currently works alongside his brother Eric as a trustee and executive director of The Trump Organization. The trust was established to oversee all his father's assets during the latter's presidency. Trump also has been involved in politics, especially since his father's presidential campaign, including facing criticism following the 2017 revelation of a meeting with a Russian lawyer, with the promise of receiving damaging information about Hillary Clinton's campaign in the 2016 presidential election. Trump was born on December 31, 1977 in Manhattan, New York City, to Ivana Marie (née Zelníčková) and Donald John Trump. He has two younger siblings, Ivanka and Eric. He also has two half siblings, Tiffany, from his father's marriage to Marla Maples, and Barron, from his father's current marriage to Melania Trump. Trump was particularly close to his maternal grandfather and is fluent in Czech. As a child, he encountered reporters asking about his parents' widely publicized divorce. To protect her children, Ivana Trump sent them to boarding school. Trump was educated at Buckley School and The Hill School, a university-preparatory boarding school in Pottstown, Pennsylvania, followed by the University of Pennsylvania's Wharton School, where he earned a B.S. degree in Economics. After college graduation, Trump moved to Aspen, Colorado. He hunted, fished, skied, lived in a truck, and worked as a bartender for a year before returning to New York and joining the Trump Organization. Trump has supervised building projects, including 40 Wall Street, Trump International Hotel and Tower, and Trump Park Avenue. He appeared as a guest adviser and judge on many episodes of his father's reality television show The Apprentice, from season 5 in 2006 to his father's last season in 2015. On January 11, 2017, his father announced that he and his brother Eric would oversee a trust that included the Trump Organization assets while his father was President, in order to avert a conflict of interest. During the 2016 presidential campaign, Trump campaigned for his father. He was characterized by The New York Times as "a close political adviser to his father." The New York Times also said "Donald Jr., Ivanka and Eric Trump — the children from the elder Mr. Trump’s first marriage, to Ivana Trump — all spoke at the Republican National Convention and have been key players in their father’s White House run." In December 2016, the Wall Street Journal and Politico reported that Trump Jr. influenced his father's choice of Secretary of the Interior, Ryan Zinke. In 2017, he has campaigned for congressional candidates Greg Gianforte and Karen Handel. In May 2017, Trump Jr. met with Republican National Committee officials to discuss the party’s strategy and resources. On June 9, 2016, Donald Trump Jr. attended a meeting arranged by publicist Rob Goldstone on behalf of Emin Agalarov. The meeting was held in Trump Tower in New York City between three members of the 2016 Donald Trump presidential campaign: Trump Jr., Jared Kushner, and Paul Manafort – and Russian lawyer Natalia Veselnitskaya, her translator Anatoli Samochornov, Russian-American lobbyist Rinat Akhmetshin, and Ike Kaveladze, a Russian-American, US-based senior vice president at Crocus Group, the real estate development company run by Aras Agalarov. Approximately a year later, Trump Jr. initially told the media that adoption of Russian children was the main subject of the meeting. On July 8, 2017, Trump Jr. tweeted his email exchange with Goldstone in an effort to provide full disclosure regarding the events leading up to the meeting, specifically that he had agreed to attend with the understanding he would receive information damaging to Hillary Clinton, which he considered opposition research. Goldstone also stated in one of Trump Jr.'s publicly-disclosed emails that the Russian government was involved. Robert Mueller, the special counsel of the Department of Justice in charge of Russia-related investigations, is investigating the emails and the meeting. During the campaign, Trump drew controversy for posting an image comparing refugees to Skittles, saying "If I had a bowl of skittles and I told you just three would kill you. Would you take a handful? That's our Syrian refugee problem." The makers of Skittles condemned the tweet, saying "Skittles are candy. Refugees are people. We don't feel it's an appropriate analogy." Another controversy arose when Trump retweeted remarks by psychologist Kevin B. MacDonald about alleged favors exchanged by Hillary Clinton and Switzerland's largest bank (McDonald has been accused of anti-semitism for some of his writings). On the campaign trail, Trump promoted Alex Jones' conspiracy theory that Hillary Clinton wore an earpiece to a presidential forum and that official unemployment rates were manipulated for political purposes. In September 2016, Trump Jr. cited Holocaust imagery to criticize the main stream media's seeming uncritical coverage of Hilary Clinton during her campaign, by "letting her slide on every discrepancy", while also accusing Democrats involved in the 2016 campaign of lying. Trump Jr. said if the Republicans were committing the same offences mainstream outlets would be "...warming up the gas chamber right now." In March 2017, Trump criticized the Mayor of London, Sadiq Khan, after the 2017 Westminster attack, which in turn led British lawmakers to criticize Trump Jr. British journalists said that Trump Jr. had quoted Khan out of context when he criticized him. Khan did not respond to the criticism, saying he had "far more important things" to do. In April 2017, he lauded Mike Cernovich who promoted the debunked Pizzagate conspiracy theory, saying, "In a long gone time of unbiased journalism he'd win the Pulitzer". In May 2017, Trump promoted the "long-debunked, far-right conspiracy theory" that Bill Clinton was linked to Vince Foster's death. Trump married model Vanessa Kay Haydon (born December 18, 1977) on November 12, 2005, at the Mar-a-Lago estate in Palm Beach, Florida; the service was officiated by Trump's aunt, Judge Maryanne Trump Barry. Haydon is the daughter of Bonnie and Charles Haydon, and is of half Jewish and half Danish descent (grand-daughter of Danish jazz musician Kai Ewans). She is an alumna of the Dwight School and studied psychology at New York's Marymount Manhattan College. They have five children (two daughters and three sons), born in 2007 and later. In his childhood, Trump learned to hunt and fish by spending time with his maternal grandfather in what was then Czechoslovakia. Controversy erupted in 2012 when pictures surfaced of an African hunting trip Trump had taken in 2010. In one photo Trump has his arms around an endangered, dead leopard, and in another he is holding a knife in one hand and a bloody elephant tail in the other. Although the hunt was legal, many people were outraged, and at least one sponsor dropped his father's Celebrity Apprentice TV show. What's the good word on Donald Trump Jr.?